Lush Buffy The Backside Slayer: Love this. Does a great job smoothing out the rougher wobbles. Have already repurchased. 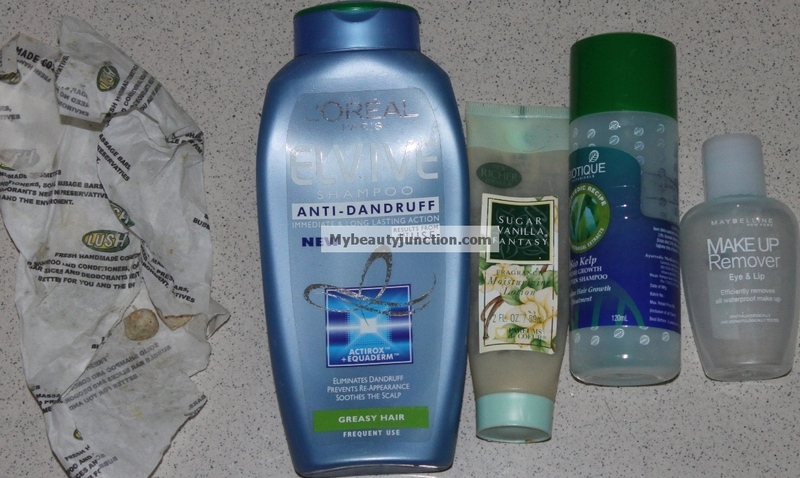 L'Oreal Elvive Anti-Dandruff shampoo: Didn't do what it said; no repurchase. Maybelline Makeup Remover: Bought in an emergency. Does its job okay, but I find Bi-facil less greasy. No repurchase. Biotique Sea Kelp shampoo: Did a good job with gentle cleansing, but have too many shampoos queued up to repurchase. Sugar Vanilla Fantasy moisturising lotion: (Parfums de Coeur) Loved it, but way too many moisturisers in my stash to get through. 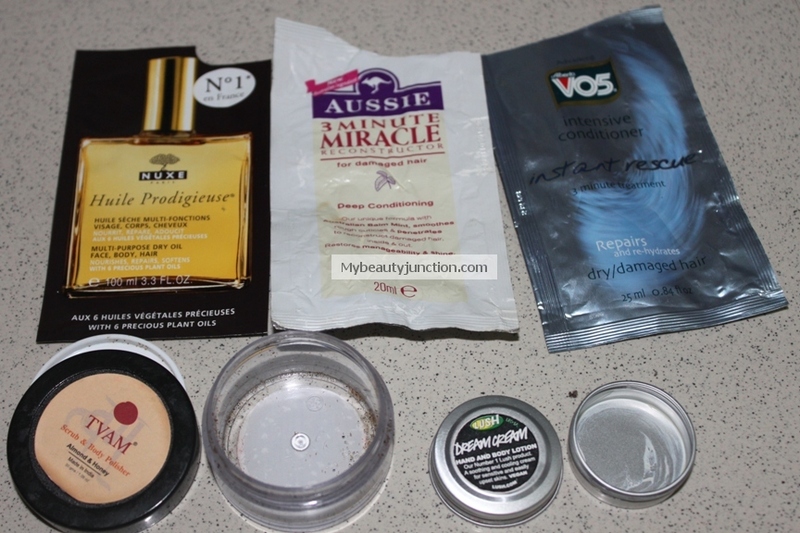 I got the idea of doing a samples' empties post from Louise of Vanity Corner. While I shall continue to hate sachets forever and refuse to pay for them, I received quite a few generously-sized sachets free this year with all the online shopping I did. So, I painstakingly emptied ones with more than 5ml product into small containers and used them! Lush Dream Cream: A tad greasier than Sympathy For The Skin (read review here), so will not repurchase. TVAM Scrub: Didn't like. It looked like a lubricant, with granules suspended in slime. It didn't feel "scrubby" either. Will not repurchase. Aussie 3-Minute Miracle Conditioner: A decent 20ml sachet. Made my hair super-soft. I have Aussie full sizes in my stash. VO5 Instant Rescue Conditioner: As above (only, this was 25ml). NUXE Huile Prodigieuse Dry Oil: I heard about this from Jac and got 3-4 sachets free. It is amazing! I use it for my hair mostly and I can't live without it; I've already got another 10ml in a travel set and will order the full-size (100ml) after my online shopping ban. This deserves a detailed review, so watch out for it.